"Quality Service in Parking Lot Maintenance for Over 40 Years!" 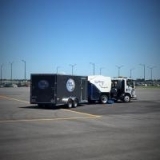 KLM offers parking lot air sweeping, power washing and related services throughout our Greater St. Louis service area. If you're located within the circle you see on the map around St. Louis, then we encourage you to also see the difference it will make when KLM handles your sweeping and exterior maintenance services. 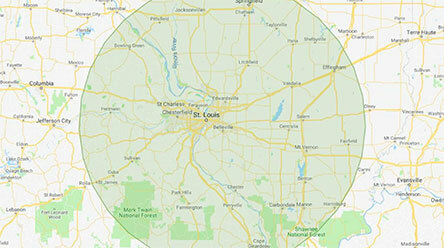 Click here to see our service map in a larger, more readable, size. KLM owns and operates a variety of makes and models of air sweepers. All are twin-engine machines in order to provide the power needed to pick up virtually any type of debris, light or heavy, that might be found on the pavement surface. 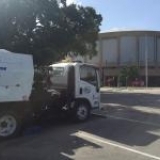 We keep our sweepers well maintained and our operators are fully trained to do a great job for you each and every time. To ensure we are able to take care of your service needs in the most appropriate way possible, we are operational 24/7/365. For more information, call 618-978-9276 for a FREE professional assessment of your needs. You'll be glad you did! Millennium Maintenance and Power Sweeping, Inc.